I yearn to return to New Mexico. My body is here in California but my eyes, and mind, are on the sandstone mountains of Abiqui, searching the expansive deep blue sky. Five months ago I was privileged to join a group of 100 women writers, poets, artists for a week at Ghost Ranch in Abiqui, NM. We were there to participate in A Room of Her Own (AROHO) writer’s retreat. 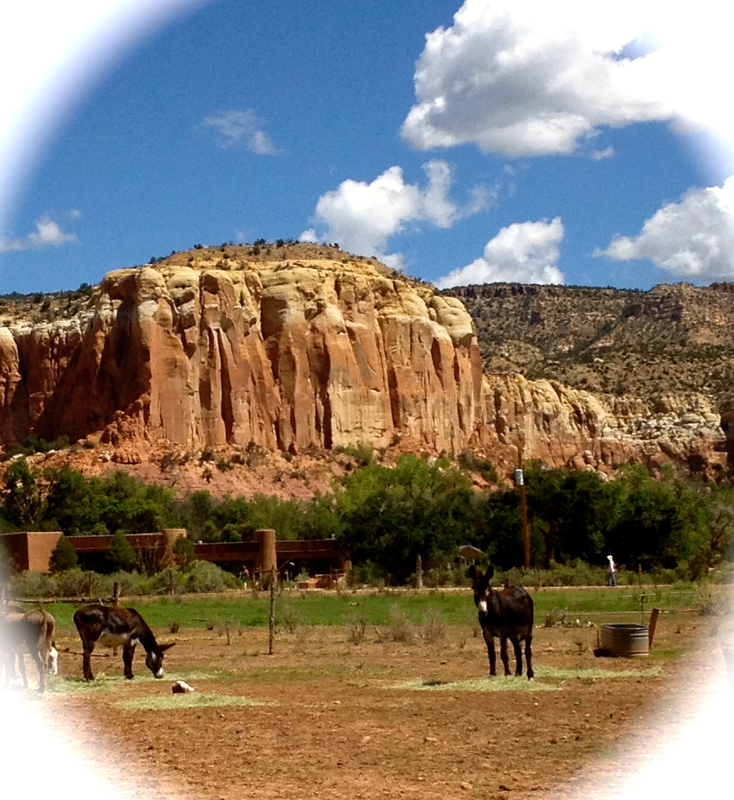 A part of me stayed at Ghost Ranch, perhaps in a bluff, tucked into a crevice. The longing is so strong that I am returning in April, for the Gathering of Nations Pow-Wow in Albuquerque. While at Ghost Ranch I met a warm, personable young woman, Karina Puente, an artist. As AROHO’s 2013 Artist-in-Residence, Karina facilitated daily watercolor classes. In the evening she set up her easel and drew writers’ portraits on a single piece of paper. We are like that aren’t we? One face with many stories beneath the surface. I like that quote: hope through art, drawing becomes a meditation. This is the video: Women Who Sit. Now take some paper and pen/crayons/watercolors/pencils and go meditate. Previous postDo You Believe In Yourself? Monica, I love this! I just submitted a story to the Orlando Prize contest. I keep going back and looking at the AROHO conference, and reading about your experiences makes me want to go even more! What a remarkable experience. Gerry, I am so glad you’ve entered the AROHO contest. The conference will change your life. There are several fellowships you can apply for that cover the costs, or you can pay the full price. AROHO women are very supportive of their alumni. Writers’ retreats are such a treat, This one sounds outstanding and the video is really amazing. I deeply admire visual artists since I don’t draw. The animation is terrific. Thank you for introducing us to the conference/retreat. I also love the inspirational landscape of New Mexico. Next retreat is August 2015. There are several fellowships available. They are also spots open for instructors. It’s refreshing to begin my day with your post and this video. Thank you, Mona! I just found out you are an AROHO sister?! On their website you were the 2009 Orlando Poetry Prize Winner. At our writing group, the other night we reviewed some poetry of past Orlando Prize winners. “Secrets of a Wooden Saint…” That’s where I saw your name. Wow! Neat! Small world! I learned of AROHO in 2007 — was a finalist for their “Gift of Freedom” grant. It was such an honor. I applied on a silly whim. But the whole, lovely experience with AROHO has meant so much to me and my belief in my own creativity. So nice to find a kindred here! Love the photograph! It really captures the mesmerizing scenery. Also, I really enjoyed the video. It’s such a unique concept, and the symbolism behind it is very profound.